A New Mac Tip Every Day: Firefox 3! 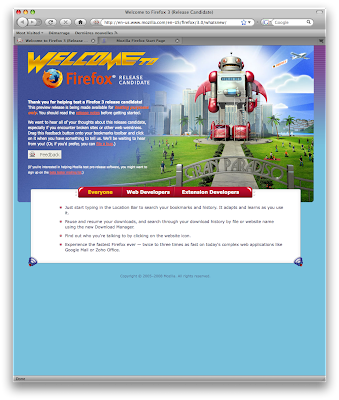 Firefox 3 is still being tested, but it is very usable. I was actually surprised when I checked it out, it has a really Mac look. It is actually making me move away from Camino because Firefox 3 now has the speed and the look. Of course, it is still a good idea to rely on a browser that is not in beta, but it still works great. More info and download link here on Mozilla website. Unfortunately, we can't install the google toolbar (and some others) on this beta version... I prefer waiting. the 1.2 (Beta) version of Firebug at http://getfirebug.com/releases/index.html Works really well on FF3 and makes FF freeze and/or crash much less.